Write the title of the paper in capital letters and place in the middle of the page. Put the author’s name in small letters three lines down the title. Put the name of the class four lines down the author’s name. Place the professor’s name one line down the class. Write down the school’s name. Write down the city and the state. Write down the date at the end of the paper. Once following the instructions, you will get a good cover page paper with the full information needed for a reader to get who is the author. When using Harvard format, be aware of the need to put the title always right justified. 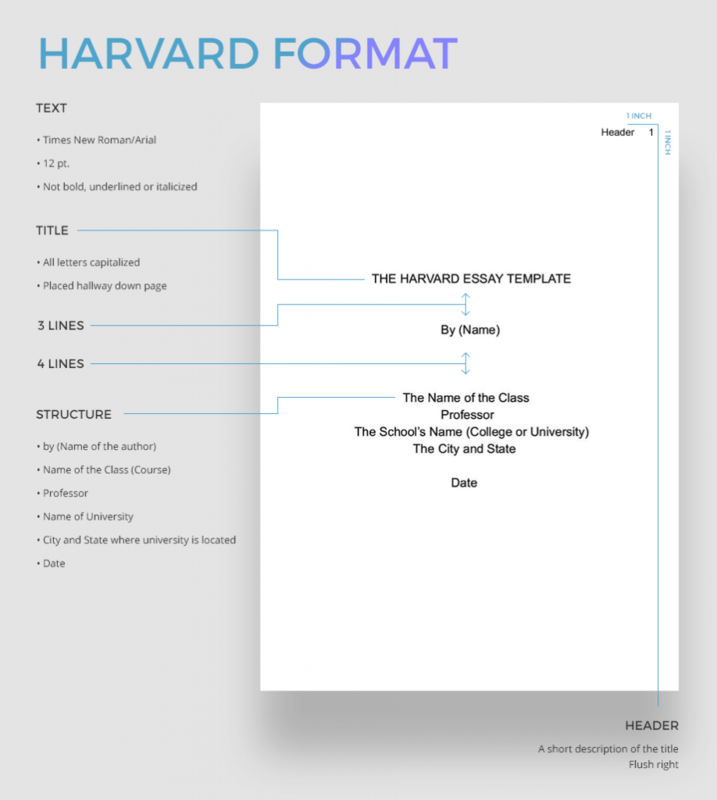 The standard Harvard essay template mostly covers the author’s name, the name of the class, professor’s name, University’s name, city, and state mentioned (use university location), and the date. Be very attentive when dealing with Harvard style paragraphs. It is important to provide a proper structure of the text, thus making the first paragraph quite appealing and informative. It is also useful to start the text with a captivating quotation or some unusual intriguing fact. In general, it keeps the information, which allows finding out what the essay paper is about, in fact. The introduction part remains both captivating and allows bringing the reader closer to the main idea of the paper, its thesis sentence. Be aware that a thesis always reveals the main idea of the entire article. The body part’s beginning always includes an indication of the further discussions. The further text embraces the supportive facts that must reveal the rightness or wrongness of the offered thesis. Mostly, this paragraph contains facts, analysis’ results and quotations. The next paragraph contains the text, which summarizes the previous argumentation. It is possible to use subheads if it allows explaining the main thesis better. It is important to provide a proper article’s structure, once using Harvard essay requirements. All paragraphs must be places with the transitions between them, thus they must never be unified. It is proper to use in-text citations when formatting your paper in Harvard style. When citing in Harvard style, write down the author’s name and initials, year of publication, and page number. Be sure to provide the citations since facts and other’s people ideas without proper quoting can be considered as a plagiarism. For instance, the citation from Stephen Edwin King book published in 2012 page 58 will look like the following – King E. S., 2011, 58. With such an information description, it is easy for readers to find the original sources of the information. Harvard style is a professional formatting style that prefers such legible fonts like Ariel or Times New Roman 12. Avoid using any fancy fonts since in this formatting style they are not appropriate. Use left margins and arrange the essay double-spaced. Put quotes into quotation marks, and use italics for quotations. This allows users to find the referred sources easier. The conclusion is a very important part of every article written in Harvard style. It is important to write it accurately and provide interesting thoughts and recommendations. The first sentence appeared in the conclusion must reveal the main thesis and remind the reader what was the main subject of an entire research work. Write down the core results of the research work, proven facts, and provide some recommendations. The conclusion remains some sort of an article’s summary together with the emphasized results and proven ideas. Make sure to provide a strong ending message to let your readers think long about yours researches after finishing reading an article. End the article with a proper reference page that contains references on the all used materials.